One of the first major Johnson exhibitions of the tercentenary year is now open at the Huntington Library. Guest curated by Johnson scholar O.M. Brack, the exhibition draws on the collections at the Huntington and the outstanding private collection of Loren and Frances Rothschild. Sadly, I won’t get a chance to see this myself, but if you’re in the area between now and September 21st, I urge you to stop by. We’ve just updated the page for our upcoming symposium Johnson At 300 with the registration form, schedule of events, and hotel information. We’ve got an outstanding lineup of participants, and of course we’ll be opening the first exhibition of the Hyde Collection since it arrived at Houghton. I hope you can join us. Published in:John Overholt |on May 5th, 2009 |Comments Off on Regsitration is open! Defamation is sufficiently copious. The general lampooner of mankind may find long exercise for his zeal or wit, in the defects of nature, the vexations of life, the follies of opinion, and the corruptions of practice. But fiction is easier than discernment; and most of these writers spare themselves the labour of inquiry, and exhaust their virulence upon imaginary crimes, which, as they never existed, can never be amended. Samuel Johnson, The Idler, no. 45. This week’s episode of On The Media contained an interview with Eric Burns, author of All the News Unfit to Print: How Things Were… And How They Were Reported. This blog isn’t the place for modern political issues, so I’ll steer clear of my skepticism about his defense of McCarthyism. But I cannot allow his highly unconventional (to put it politely) description of Johnson’s Debates in the Senate of Lilliput to go unchallenged. 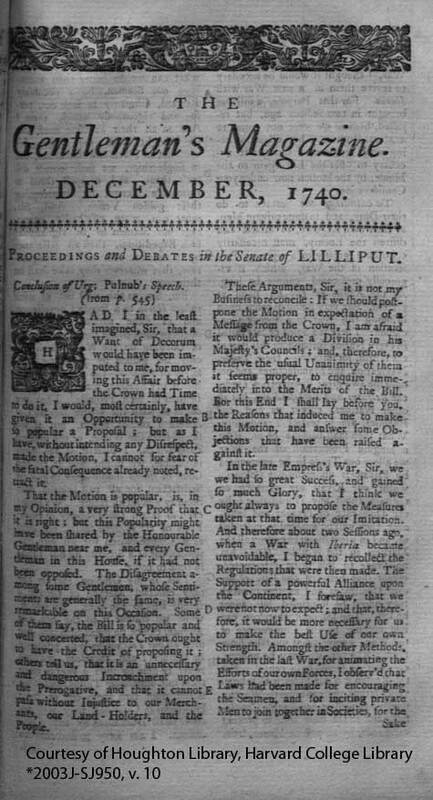 In the interview, Burns says that Johnson was hired in 1720 by Gentleman’s Quarterly to cover the debates of Parliament. In fact, GQ wouldn’t exist for another 200 years; it was Gentleman’s Magazine that Johnson worked for. And he was 11 years old in 1720; he started writing the debates in 1740. I suspect these are both simple slips of the tongue, and rendered correctly in the book, but it doesn’t exactly inspire me with confidence in his grasp of the issues. Moving on to the substance of the matter, Burns charges that Johnson was assigned the job of Parliament beat reporter, but was too lazy to attend the debates, and so simply made them up. In his view, because of Johnson’s sloth and mendacity we have no real historical record of the period. The reality is considerably different. The press was in fact barred from reporting Parliamentary debates at this time, so Johnson’s reports were by necessity wrapped in a layer of fiction: from the title, reflecting the conceit that they were written by Lemuel Gulliver’s grandson, to the anagrammed and otherwise distorted names of the speakers. Johnson would have been expelled or worse if he’d simply sat in the gallery taking notes, so instead he worked at home, composing the speeches based on smuggled out reports of who spoke and on what issues. Any gap in the historical record is Parliament’s doing, not Johnson’s. Furthermore, as Robert Folkenflik points out in the Cambridge Companion to Samuel Johnson, the reports are full of cues to readers that they are not literal transcriptions of the speeches; phrases like “spoke in this effect” or “spoke to this purpose” introduce many of the speeches. Painting Johnson as the Stephen Glass of the 18th century is ahistorical grandstanding, and doesn’t stand up to any meaningful encounter with the facts.